Highlands County, Fla., held its inaugural tire buyback event last month at the annual “12 hours of Sebring” endurance race, and accepted more than 17,000 tires that would likely remain scattered along the city's roadways and landfills. Residents of Highlands County, Fla., lined up before daybreak last month for a chance to earn some extra cash and clear the extra rubber clutter in the community’s landfill. Highlands County held its inaugural tire buyback event at the annual “12 hours of Sebring” endurance race, and accepted more than 17,000 tires that would have likely remained scattered along the city's roadways and landfills, according to Highlands County Today. The illegal tire dumping issue costs Highlands County about 38,000 a year, Ramon Gavarrete, Highlands County engineer, told the newspaper. Highlands County offered county residents $2 per tire, for as many as 25 tires a load, according to the report. The expectation was to collect 10,000 tires and pay out $20,000. By the final count on the following Monday, 17,695 tires were dropped off, the National Association of Counties (NACO) reports. County officials that manned the event were prepared to pay out only $20,000, but more than $35,000 was paid out to residents. Some county residents were given IOU’s to be paid later due to the overwhelming response. The success of Highlands County’s programs and others like it, in Jacksonville, Fla., and Montgomery County, Ohio, can mitigate the issue of illegal dumping and the environmental concerns associated with tire stockpiles. According to the Environmental Protection Agency, there are more than 275 million tires in stockpiles across the country, which attract rodents and often lead to fires. Tire buyback programs have become a popular way to rid communities of environmental waste and save counties on the manpower required to remove tens of thousands of tires every year. 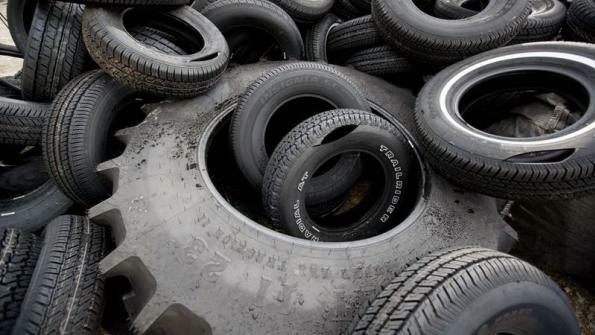 In nearby Jacksonville, city officials gathered 23,000 tires last year through their inaugural tire buyback program, according to the city’s website. The city also added the element of returning illegal snipe signs for .50 cents a sign, which helped collect 6,000 signs last year. Highlands County commissioners approved its tire buyback program in May. In addition to holding such events, the county commission also approved funding for a a designated sheriff’s deputy for enforcing county dumping laws, according to NACO’s report. For next year’s event, county officials hope to emphasize the penalties and be more prepared for the onslaught of county residents eager to participate in the profitable recycling program. “It was successful — 17,000- plus tires; that’s definitely successful, and we’re going to do it again,” Gavarrete told NACO.